Out of ideas? Try one of these! Looking to spice up your Halloween with a fun Halloween Internet meme costume this year? You need not look any further than your favorite social networking sites to find some great ideas for DIY costumes — that's where we got inspired! If you’re looking for something a little more creative than the traditional pumpkin, pirate or fairy princess costume for Halloween, get some of your inspiration from modern day technology you use every day. Here are some great, geeky Halloween costumes all inspired by some of your favorite online trends, gadgets, ​memes, games, and websites. Why not be your own Instagram selfie for Halloween? It's an easy enough idea that will surely give everyone a few good chuckles. You can use a piece of cardboard to recreate a giant, physical version of an Instagram photo, cut out the middle, and hold it up in front of your face. Don't forget to add a ton of hashtags in the description! Cat costumes are usually pretty popular come Halloween, and Tard the Grumpy Cat is the perfect character you can use to step things up a little. She's arguably the most famous and beloved cat on the Internet right now. The hardest part about this costume is probably remembering not to smile. Grumpy Cat does not smile, ever. Let's face it — emoji is now basically a language of its own. Almost anyone who owns a smartphone can recognize them, and there are hundreds to choose from for Halloween costume inspiration. Like the Instagram costume, making your emoji costume is as easy as drawing it out on a large piece of cardboard and securing it to your clothing. The Doge meme is still hanging on strong, despite reaching the height of its meme popularity in 2013. Admit it, it's still a great meme. 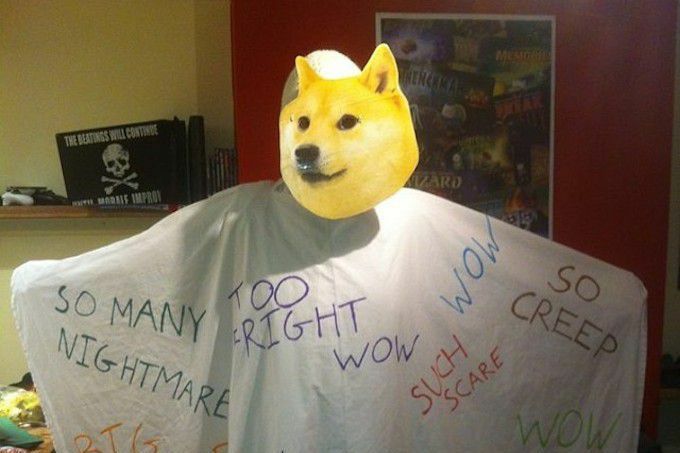 For a costume inspired by the mighty Doge, simply print out the face of a Shiba Inu with the meme's distinctive wording style, like "wow" and "such scary" (or just write them directly on an old piece of clothing if that's your thing). Anyone with a knack for getting creative with making their own Halloween costumes can probably come up with a pretty great costume inspired by Minecraft — that awesome game about building things with blocks. All you really need are some cardboard boxes and some paint. What, really, could be easier? Put a spin on the classic ghost costume by adding a few features to it so it looks like the Snapchat ghost! Both spooky and geeky, all you need is a white sheet and some easy craft supplies you can pick up almost anywhere to create the iconic smiley face of the Snapchat ghost. As one of the most popular internet-inspired costumes of all time, past Halloween parties at universities and colleges around the world usually, see at least one person dressed up as a Facebook profile at Halloween. Similar to a lot of other costumes on this list, most can be homemade with a large piece of cardboard, some blue paint or markers and a cutout square where the profile picture should be. It may be slightly overdone by this year, but it's still a lot of fun to look at it. You’ve probably spent hours on your mobile device launching virtual birds into virtual mid-air so you can knock down some virtual blocks and kill some virtual green pigs. Now, you can dress up as your favorite Angry Bird for Halloween. Try a pop-up Halloween store in your neighborhood for costumes. They are available for adults and babies for the red birds, the yellow birds, the black birds and even those pesky green pigs. Who could forget that manly-scented hunk who graced our computer screens on YouTube a few years ago? The Old Spice Guy sparked the fastest growing viral campaign the Internet has ever seen. Why not charm the ladies by pretending to be him for one night? All you need is a white towel and a bottle of Old Spice body wash. The Internet just can’t get enough cats. Cats seem to be the ultimate meme. The “Nyan Cat” was just a short YouTube video of an 8-bit animated cat that had a Pop-Tart as its body, with a rainbow coming out of its rear end. The animated cat flies through the air past several 8-bit stars to a ridiculous song that sings “Nyan, Nyan, Nyan” over and over again. Some people have gone so far as to dress their own cats up as the Nyan cat. What better way to honor the life of Steve Jobs by dressing up as your favorite mobile device this Halloween? You can actually get really creative with a homemade costume if you’re willing to put in the work. All you really need is a large cardboard box or old black outfit. Decorate it any way you like by adding a few iOS icons.